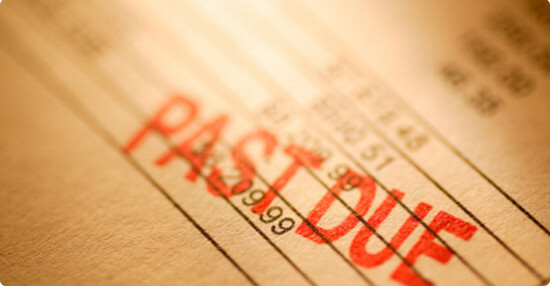 The current unsecured debts you owe will negotiated by our experienced settlement department. 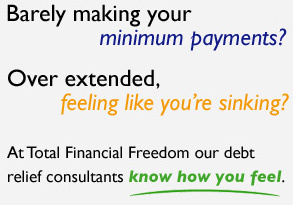 In general our clients experience a dramatic debt reduction and look forward to being debt free within 36 months. Our client’s goal is to avoid bankruptcy, and resolve their debt within 18-36 months. Because our clients pay back less, it is widely accepted as the fastest and least expensive way to get debt free, without filing bankruptcy. Total Financial Freedom aims to negotiate on your behalf, saving you thousands, and getting you back on the road to financial independence! You also have the convenience of one low monthly payment, which includes all fees. It is based on your current financial situation. Without obligation, a debt relief consultant can explore your options and arrive at one affordable monthly payment. Our debt negotiation practices are targeted toward the principal balance owed. Our settlement department’s goal is to pay back a mutually agreed sum to each creditor for an amount less than owed. Total Financial Freedom enables its clients to save large sums off the principal balances owed. In addition, our settlement advisors share a mutual interest with your financial success. In fact, a portion of their income derives from how much they save you. Our goal is to save you as much as possible and deliver you to financial independence as quickly and efficiently as possible. Utilized throughout the course of the program is a third party trust account in your name, not ours. All settlements are executed from a third party trust account, exclusively in your control. All clients have the right to confirm or deny any settlement proposed. During the entire process clients have online access 24 hours per day to review their transaction history.